Humam Khalil Abu-Mulal al-Balawi, a Jordianian doctor, is believed to have killed seven CIA operatives in suicide attack. Amman, Jordan (CNN) -- The suicide bomber who killed eight people at a U.S. base in Afghanistan last week was a loner since childhood, his mother told CNN Thursday. Humam Khalil Abu-Mulal al-Balawi wanted to be a pediatrician and went to medical school in Istanbul, Turkey, his mother, Shnara Fadel al-Balawi, said while wearing black in mourning for her son. And he aspired to go to America, she added, even telling her last year that he had booked a ticket to the United States. It is not clear that he did go to the United States. His wife said he went to Pakistan for further schooling and then found work. The man identified as the double agent was a Jordanian doctor recruited as a counterterrorism intelligence source, a senior Jordanian official said Tuesday. A former U.S. intelligence official identified him earlier this week as al-Balawi. Defne Bayrak, his Turkish wife, was "shocked" to hear what he had done, she told CNN Turk television. "It is impossible for me to make a guess if he was an agent, what was his reason going there," she said. "I am not saying whether I am believing or not believing. I am trying to say, we were not expecting something like this." He had been working in Pakistan as far as his wife knew, she said from their home in Istanbul. Bayrak, an author and Turkish-Arabic translator, said they were continuously in communication via the Internet and that he repeatedly said he was coming home. "When he phoned us, his conversations were very normal. Since he was always talking about coming to Turkey, naturally a human being would be shocked when such news comes," she said. 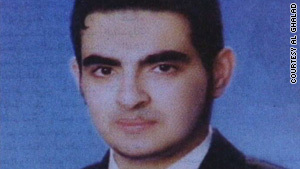 His brother told CNN that al-Balawi's actions were "out of character" and that the man was "under pressure." The man's father, who is shocked by his son's actions, said he was called by an Afghan speaking in broken Arabic from Afghanistan. The Afghan told him his son was dead and that he died as a hero in an operation to kill CIA agents. The caller said, according to the father, the circumstances could make problems for his family and that they will have to cope with it. But the caller told the man's father his son was a hero. The mother, brother and father spoke to CNN's Nic Robertson. The December 30 blast at a U.S. base in Khost, in southeastern Afghanistan, killed seven CIA operatives, including two from private security firm Xe, formerly known as Blackwater. The eighth victim was Jordanian Army Capt. Sharif Ali bin Zeid, a cousin of Jordan's King Abdullah II. The suspected suicide bomber left Jordan a year ago for Turkey to finish his medical studies, but his family realized three months later he wasn't there, relatives said. The family didn't know whether the Afghan caller was from al Qaeda but believes it was some militant group. A Jordanian official, speaking on condition of anonymity, had said authorities in Jordan arrested al-Balawi more than a year ago "for some suspicious information related to him" but released him due to lack of evidence. "After (a) few months, he got in touch with us through the Internet and sent us several e-mails that include very important and rather dangerous information that might affect the security and stability of the country," the official told CNN. "We kept in touch with him through e-mails in order to get more information and also trying to bring him over to be able to get more information. We shared and exchanged the information he gave us with some other friendly countries that are involved in countering terrorism." The official said Jordan could not confirm that al-Balawi was the bomber, "because we are not on the ground." "But we are not denying that if he is the one, then he is the Jordanian doctor," the official said. U.S. sources said bin Zeid was the Jordanian operative working closely with al-Balawi, who was from the same hometown as the onetime leader of al Qaeda in Iraq, Abu Musab al-Zarqawi. Jordanian and U.S. intelligence agencies apparently believed al-Balawi had been rehabilitated from his extremist views and were using him to hunt Ayman al-Zawahiri, al Qaeda's No. 2 figure, the former intelligence official said. Former CIA official Robert Richer called the bombing the greatest loss of life for the agency since the 1983 bombing of the U.S. Embassy in Beirut, Lebanon, which killed eight agents. An American intelligence official vowed last week that the United States would avenge the attack. CNN's Nic Robertson, Caroline Faraj and Talia Kayali contributed to this report.